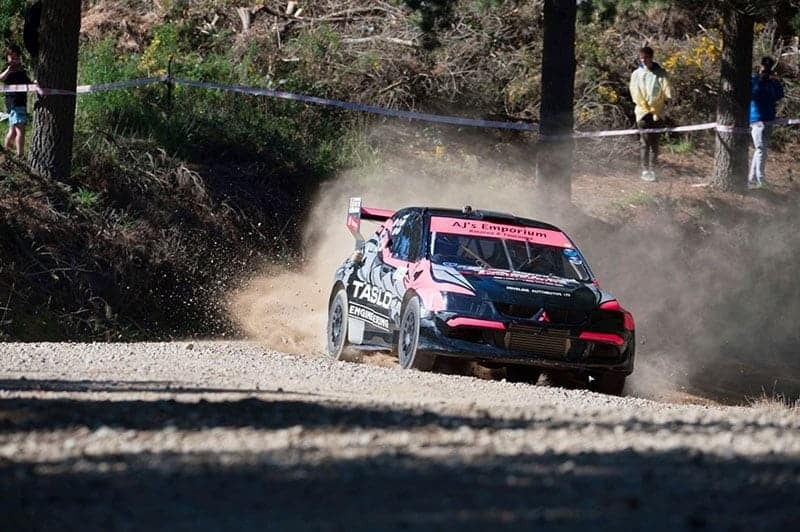 Sloan Cox is going all out to defend his Ashley Forest Rallysprint title this weekend. The Ratec Motorsport Club-run event has gained a mighty following over the years and this year’s battle between Cox as the 2017 winner, Kiwi WRC driver Hayden Paddon and Scottish rally star Alister McRae is set to be one for the record books. “My goals are simple – to win,” says Cox as he finalises preparation of the car dubbed the Hillclimb Special Evo 8 in which he won the 1.7km gravel rallysprint last year. As well as winning the event last year, Cox created his own slice of Ashley Forest history in 2016 when he broke the record three times in one weekend. Ultimately he couldn’t take the win that year due to mechanical issues on the final run. Cox currently holds the course record of 54.96 seconds, which he set on his penultimate run last year. “The record is going to get beaten again, for sure. The weather is looking perfect, so everyone’s going to be pushing harder. There’s a lot riding on Cox’s abilities as a mechanic as well as a driver, because he does the bulk of the work on the car himself. Currently weighing about 1000kg and putting out just over 500kW at the wheels, the spaceframe and aluminium shell Hillclimb Special Evo 8 was originally built for Race to the Sky and similar events where there are no regulations on vehicle power or weight. The Ashley Forest is located north of Rangiora in North Canterbury. The event sees all entrants do up to four qualifying runs, time permitting, on Saturday, and one qualifying run on Sunday morning before the elimination runs for top 32 commence. These narrow down into runs for the top 16, eight, four and then the final two fastest competitors. A cash bonus of $1000 is also awarded to the competitor, if any, who holds the new course record by the end of the weekend. The Ashley Forest Rallysprint trophy will be presented to the overall winner, and the Ashley Forest 2WD trophy will be awarded to the fastest 2WD competitor.